This flute duet appears in Blake's Young Flutist's Magazine, published in 1833. 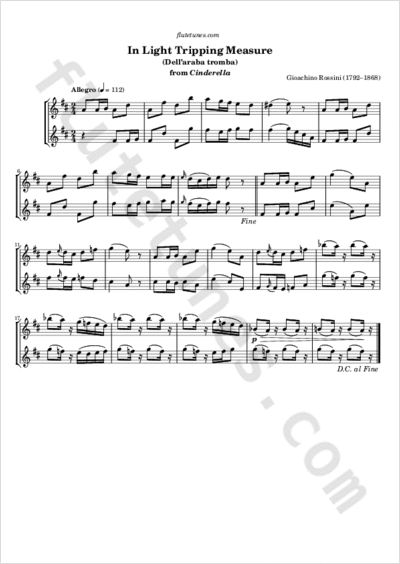 It is an arrangement of a chorus from the beginning of Act III of Cinderella, the 1831 English-language adaptation of Rossini's La Cenerentola by Irish violinist and composer Michael Rophino Lacy. Like most of the music from this last act, “In Light Tripping Measure” is not taken from La Cenerentola: it is an adaptation of “Dell'araba tromba”, an aria from Rossini's 1820 opera Maometto II (also known as Le siège de Corinthe).